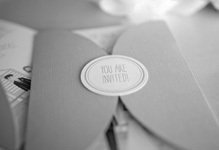 Invitation Station – Cara Marie Designs, creates custom designed stationery to suit each individual event. If you are after something that will showcase your event in the most unique way, we would love to hear from you. We do not mass produce items, but revel in taking our customers on an awe-inspiring and adventurous stationery journey. We will not provide anything but a quality product and we aim for unparalleled customer service in our field. We are here to assist in making your stationery dreams a reality.